BMW has a reputation for producing high-performance luxury cars with plenty of style, and we’re happy to be able to bring you that impressive lineup of BMW models here at your local BMW dealership, BMW of Arlington! When you’re looking for your next new BMW or BMW finance and auto repair, we hope you’ll choose us for all your needs-but not before we show you what’s so special about our BMW dealership serving Dallas, Fort Worth, and Arlington. We’re excited to give you a sneak peek into the many ways we serve valued customers like you! Are you looking for a quality new BMW in your area? Whether you’re shopping for a new BMW, Pre-owned car, or BMW Certified Pre-Owned car, you can rest assured that there’s something just for you at your local BMW dealership. For sporty sedans, SUVs, coupes, convertibles, and more, our BMW dealership has you covered. You can check out our 2 Series all the way on up to our 7 Series, and it doesn’t stop there. Our X Series is your source of versatile SUVs, and the M Series is loaded with several performance-tuned cars, so you can have your pick. Also, if you want to learn more about any BMW models, our friendly team is here for you. At our BMW dealership, good service goes far beyond car sales. We want to make sure you can get behind the wheel in a stress-free way, which starts with manageable payment plans. If you’re looking for a car loan or lease, our BMW Finance Center can help you find the best possible rates and terms for your lifestyle. Once you’ve secured BMW financing or found a lease plan and driven off our lot, stress-free driving means a safe and well-maintained vehicle on the road. Our BMW Service Center can help you care for your ride. Staffed by technicians specially trained to work on new BMW and pre-owned cars, it’s convenient for your oil changes, tire rotations, and thorough systems inspections. Few things are as exciting as driving off the car lot in a nice, new BMW. However, it’s important that you do it right for maximum fulfillment and satisfaction. When you visit your local BMW dealership, our customer-driven approach takes your long-term needs and goals into account, so you’ll feel satisfied with your new BMW long after you leave our dealer. 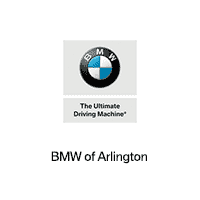 If you live in or around Arlington, Dallas, or Fort Worth, feel free to give us a call or stop by the showroom of your local BMW dealership in Arlington. Our convenient location is just a short drive away, and we’re excited to help you make the most of your visit!